The following testimonials are from customers that have bought the QuickStart 2000 and were so pleased with the unit that they wrote Ed a brief thank you. Ed will be adding customer testimonials frequently to this page, so check back often. If you have purchased the QuickStart 2000 and would like to send Ed a testimonial, you can fill out the general contact form or send Ed an email at ed@ebeyond2000.net. I Installed the Quick Start 2000 on my 1978 HD Lowrider (FXS) but had a bad module - Ed quickly sent me another one overnight. Easy to time and it started right up. My engine used to cough once in awhile,and now it doesn't. Runs really well now. Ed stands behind his product, and I will recommend it to anyone. 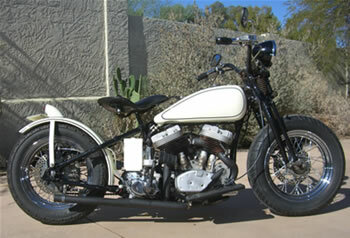 Hope yall are doin good up north there:) Well that 70 Ironhead is purring like a kitten... Your unit was the best money I have ever spent on it. One thing to note... Lining up the marks, she didn't run holding open the advance, I just lined up the marks without advancing and there it was! Put a timing light on her and she was dead on. Starts in 1/2 revolution every time. And this was a newly rebuilt unfired engine! Has a Mikuni carb also,which I had never tried, so was very unsure about it. The rotor fit nice and snug no tape needed. Your product is worth twice what ya sell them for or more! Just installed my QuickStart 2000 in my 48 panhead! Wow what a difference. The motor even sounds different now. One of the best changes I have made to date. I could not be happier with the product. I only put about 25miles on the bike since the installation but that was enough for me to tell the difference. Thanks for a great product. Just to let you know: The Quickstart2000 unit arrived last Tuesday (real fast delivery out of the US) and I installed it yesterday. Installation and timing was a piece of cake. I drove my first 10 miles yesterday without any problem. It seems to start and run better than it did before. Quite a good investment; I will advertise it. Hey Ed, just wanted you to know that the unit arrived last week, and I put it in today. Wow, what a diff! My '65 was really acting up this year, sometimes taking a hell of a lot of work to get it to light. I dropped in your unit, gave her 2 dead kicks, switched on and it fired in 2 kicks. I tweaked the timing a degree or so and it's a 1 kicker again! Pure genius, Ed. I've been riding this machine since 1977, and you couldn't guess how many times I wished someone made this set-up for the old pigs. Though you have been doing this for 5 years, I just happened upon it about a day or so before I ordered mine. As soon as I saw it I knew I had to have it. Thanks a million, man, I am 1 happy dude. If you want, you can see some pics of my ride at www.myspace.com/panheader. Keep up the good work, Ed. Thanks again for the ignition- great addition to my panhead. Hope you enjoy the article. Here it is almost a year later and I'm happy to report that my '57 Sporty runs and starts better than ever. It was a little tricky to get it timed but now starts right up. Wanted to let you know how pleased I am with your ignition system I bought recently. Easy installation was just the icing on the cake as it starts easier, every time and it's much faster. I still don't believe that part but it flies and I have been giving those mechanical brakes a workout. Thanks for a terrific product and I have a few friends I'll turn on to it after I run away from them a couple of times. I enclosed a picture of my '51 FL that I installed it on. The old VL never ran better! Attached is a photo. I wanted to let you know of my experience so far with The Quickstart 2000. Feel free to use this as a testimonial. 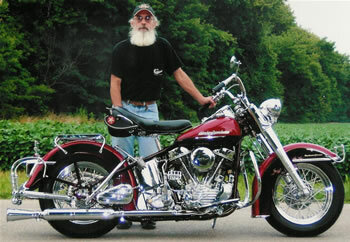 My bike is an original paint 1953 FL. I was looking for an alternative to the breaker points ignition as I was having trouble with the points pitting and had high speed misfire. I think the root of my problem was inconsistent voltage from my generator combined with low quality after market parts. I didn't want to change from 6 Volt, or change my coil. So I ordered your QuickStart 2000, 3 days later the package arrived. The packing was just great, nice and compact, all the components were well packed and protected. The directions were clear with good quality photos. The kit was super complete, right down to the crimp terminals, I was impressed that you had provided the cloth wire covers. My total installation took less than an hour. I'm pretty familiar with how the points housing fits together, and the instructions were really clear. I'd though about finding a different location for the + 12 VDC (so that I'd only have 1 wire to the coil, but in the end decided to stay with your directions). The second wire isn't really noticed anyway. I ran the new wiring behind the linkert support and the rod covers, and up to the coil. When I completed the install the new ignition sensor worked perfectly, there was no need to retime the bike, I use the manual timing control and as best I can tell the timing is the same or within half of a degree. So far I have a couple of hundred worry free miles on the ignition, overall the bike runs better at all speeds and the ignition helps take care of the coarse fuel metering by the linkert, we have a lot of air density changes here. I'm really happy with the Quickstart and recommend it to any rider, 6 or 12 volt ( or in between). Just wanted to give you thumbs up for my new unit. Got it Thursday afternoon and put it on the bike Thursday evening. Easy fix, and it works wonders. All the guys in the garage want one now, so I guess you will hear from me again shortly. Once again thanks. By the way, how about an update? Had your ignition about a year now and it works great! Makes it easy to start and I haven't had to use a feeler gauge in forever! Thanks! My old panhead starts like a dream, I've owned this bike for over 30 years, and I have done my share of kicking in that time, but this is beyond sweet just knowing that when there is someone watching and the pressure is on, this bike will start. I'll pass the word. Thank you Ed. My right ankle has not felt this good in years. The old pan has never run better. I just wanted to pass on a little information so that you may have it in the future. The original schematics for all 40’s Harleys tell you to connect the black wire from the points to the rear of the coil which may be fine for the stock coil. The after market replica coils from Colony and others have the terminals in the reverse order and the positive + terminal is the rear one. As soon as I connected your products red wire to the - side I started the bike and it runs better than ever. Thanks.